Adsorbed proteins on artificial surfaces can be recognized by platelet adhesion receptors, potentially leading to the subsequent adhesion, spreading and activation of the platelet. 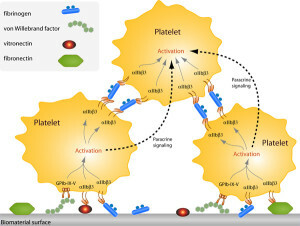 The natural plasma soluble platelet adhesion and aggregation molecules fibrinogen, fibronectin, vitronectin, immunoglobulins and von Willebrand factor (VWF) are all potential mediators of platelet adhesion and have therefore been thoroughly studied in this aspect (Figure 2 presents a schematic drawing of biomaterial induce platelet adhesion and aggregation). Among these candidates, fibrinogen has been shown to be the key protein in the adhesion process [17, 18], whereas fibronectin, VWF and immunoglobulins only show supporting effects that may be related to platelet activation [19, 20]. Furthermore, the amount of adsorbed fibrinogen required to facilitate platelet adhesion is extremely small, ~ 7 ng/cm2 . Platelet adhesion to surface-bound fibrinogen is however intriguing, since the fibrinogen receptor integrin aIIbß3 is required to be activated into a high affinity state by inside-out signaling to effectively bind fibrinogen in solution . This mechanism is however overridden as integrin αIIbß3 in its “low affinity” state evidently is capable of binding surface adsorbed fibrinogen . It is speculated that this is facilitated by a change in the conformation of fibrinogen when adsorbed to surfaces. The kinetics of platelet adhesion to artificial surfaces have been revealed to be very rapid and initiation may take place in < 5 s for hydrophobic surfaces and <30 s for hydrophilic surfaces . However, this is not very surprising with the physiological function of platelets in mind: to rapidly adhere and aggregate at the site of vessel injury. The direct effect of wettability on platelet adhesion and activation has been studied with the use of hydrophilic-to-hydrophobic gradient surfaces, with water contact angles ranging from 40-90°. From this study it was evident that platelets in plasma adhered in increasing numbers with decreasing wettability . This is no surprise since fibrinogen is retained to a greater extent by hydrophobic surfaces than by hydrophilic surfaces . Prolonged exposure of thrombogenic materials to blood in vivo has showed that platelet numbers in blood decrease with surface exposure time. This discovery has been used to measure the actual thrombogenic effect of different biomaterials in animal models . molecules like fibrinogen, von Willebrand factor, vitronectin and fibronectin.